There are several reasons why Tokyo is the world's best city to live in. One of the reasons, perhaps, is the convenient transportation that permits a quick change of scenery for Tokyoites. For city dwellers, a weekend beach trip is easily doable. Check this list for an ideal sea and sand day trip. From Yokosuka, regular ferry trips can transport you to Tokyo Bay's sole uninhabited island, Sarushima. Sarushima (saru means monkey and shima means island) has no monkeys, but it does have an interesting and fairly easy hiking trail that would lead you to caves and pockets of sea surrounding this island. In summer, people go to Sarushima to enjoy BBQ with family or even suikawari with friends. Since the island has no dwellers, day trips are the only way to enjoy this island. 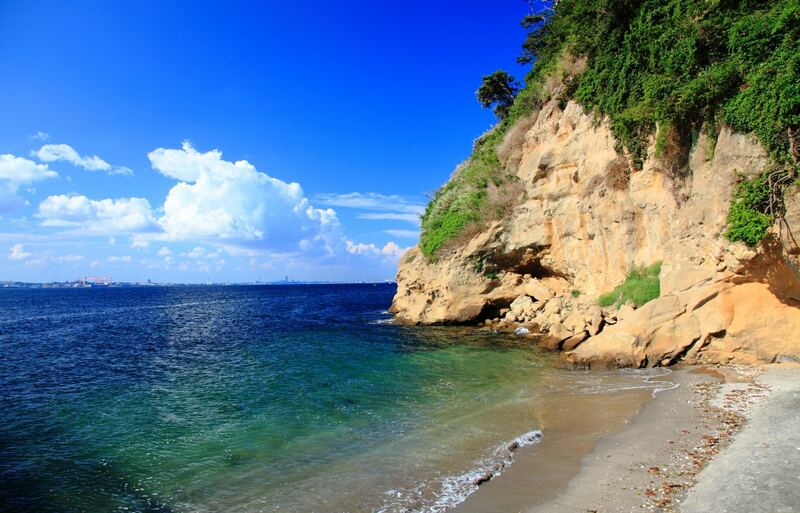 A fun ferry ride, an easy hike and a quick dip in the sea are more than enough reasons to call it a day in Sarushima. Zushi is a favorite of both locals and gaijin because of its accessibility and a variety of fun dining and drinking options available by the shore. In Zushi, you could find people sunbathing, reading a book, walking their dogs, board paddling or simply lounging on the beach chairs fronting the sea. The Zushi sunset also has a cathartic effect. If you're lucky, you might just get a view of the usually shy Mount Fuji. A closer look at the photo shows that Fuji-san is somewhere behind the clouds surrounding the setting sun. Odaiba is, undoubtedly, a happy place for most Tokyoites. It has amusement areas, outlet shops, a plethora of restaurants and romantic lights. Odaiba, too, happens to be the nearest beach to Tokyo, although it is but an artificial beach in front of the scenic Rainbow Bridge and Tokyo cityscape. A good time to visit Odaiba in summer is during the Umi no Hi (Sea Day) holiday when hundreds of lanterns are lit up by the sea. Sadly, swimming is not allowed here, but if the beach feels are all you need, then this spot ain't bad at all. Possibly the place for Japan's best hanabi (fireworks) is in Chigasaki. During the summer, the streets leading to the South Beach from Chigasaki Station, are filled with kiosks selling an assortment of foods that might make you wish summer could last forever. From thick bacon-on-a-stick, yakisoba, pizza and what have you, Chigasaki gets very lively in summer. On the first weekend of August, Chigasaki holds its annual fireworks display, usually lasting for more than an hour. What could be lovelier than glistening lights by the sea! If you're a surfer or if you'd like to see surfers, this is the place to go to. The coast connecting Shichirigahama and Inamuragasaki is famous for strong waves perfect for surfing. If you don't surf, you can still enjoy a dip in the beach or some quiet time sitting on the sand with small waves touching your toes. What makes the Shichirigahama and Inamuragasaki shoreline even more interesting is the selection of really good restaurants serving various cuisines from Hawaiian and Japanese to Italian and Australian. A favorite of the locals would be Pacific Drive, sitting exactly on the sandy shore of Shichirigahama.